We aregetting various kernel crash on a pretty new config. We are running Ubuntu 17.04 (amd64), we've tried different kernel version, native one and releases from http://kernel.ubuntu.com/~kernel-ppa/mainline/ too. Issues are the same, we're getting random freeze on the machine. Depending on the kernel version, we've got NMI watchdog errors related to CPU stuck (mentioning the CPU core id, which is random). Crash is happening randomly, but in general after some hours (3-4h). Did you experience more crashes with kernel 4.11? Please find full kern.log in attachment. Crashes appear from 24-48h of operation. None of these work. I was waiting for 4.11 to be available for Ubuntu as an official package, but it seems that this will not work either. Would it be possible for you to test the latest upstream kernel? Refer to https://wiki.ubuntu.com/KernelMainlineBuilds . Please test the latest v4.12 kernel. How to add the tag kernel-bug-exists-upstream ? Could you please tell me which address I have to send the mail to? I don't really understand how to achieve this bug report on the mailing list. It looks like that the system is stable when removing "nouveau" driver. Waiting 24/48h and will post again. I also met the problem, and your advice removing "nouveau" succeeded for work-around to stabilize system. Before it freeze every 3-5hr after booting up, but now working without problem for 2 days. 5 days update now and no crash. camparijet => did you installed NVIDIA driver instead ? > camparijet => did you installed NVIDIA driver instead ? No. I don't have to use the card for my purpose, so simply i disable it. I'm seeing this crash even with the Nvidia official driver. This is a hardware bug in the CPU. This ticket should be closed as invalid. However, that would be disabling a security feature. Was this issue officially confirmed to be a hardware bug in Ryzen processors by AMD? If so, could you provide a link to the statement? Disabling address space layout randomization (ASLR) seems to alleviate the problem, but does it solve it? I am investigating unstable behavior under load which could be related. There, disabling ASLR is not sufficient! People suggest to increase SOC voltages, use specific versions of the kernel and the like. See https://community.amd.com/thread/215773?start=135&tstart=0 for more info. AMD has not publicly commented on this issue that I'm aware of. This issue has been seen on many different operating systems. DragonFlyBSD includes a workaround for this issue. The workaround on Linux is to compile the kernel with CONFIG_RCU_NOCB_CPU, CONFIG_RCU_NOCB_CPU_ALL, and disable ASLR using "echo 0 >/proc/sys/kernel/randomize_va_space". This can be put into rc.local. It's also possible to hardcode ASLR as disabled into the kernel, but this requires modifying the kernel source, not just the config file. There is a new AGESA update released about a week ago, 1.0.0.6a, although I have not tested whether the new AGESA alone (without any kernel changes) solves the issue. I just tested 1.0.0.6a AGESA, and it does not solve this issue. In some cases just one program will crash, and in other cases the entire system will crash. I will test the workaround above later. If any of your RAM timings are odd (eg. 17), setting them to the next even number (eg. 18) helps a lot. Recompiling the kernel with CONFIG_RCU_NOCB_CPU and CONFIG_RCU_NOCB_CPU_ALL, and disabling ASLR is still necessary though. It may also be a good idea to give the SOC slightly more voltage, but not more than 1.2 V.
Can you provide link on how DragonflyBSD fixed this issue? It appears that there are two different ways that the system can crash, which is why it is necessary to both disable ASLR and to compile the kernel with CONFIG_RCU_NOCB_CPU and CONFIG_RCU_NOCB_CPU_ALL. The ASLR-related crash usually results in a single or a few programs crashing (although if an important program crashes it can bring down the entire system) and happens under heavy load. The other crash only happens if the kernel was compiled without CONFIG_RCU_NOCB_CPU and CONFIG_RCU_NOCB_CPU_ALL (Ubuntu's kernel is compiled without these options) and happens when the system is idle or nearly idle, and results in a complete system crash. If the motherboard allows it, disabling the OpCache will completely prevent (or at least greatly reduce the probability of) the ASLR-related crash, even if ASLR is enabled in the kernel. As far as I'm aware it has no effect on the other type of crash. I've also determined that changing the CPU, memory, or SOC voltages or timings has little or no effect on either type of crash. This is beyond my expertise - let's see what upstream can do. I also experience this problem since I updated yesterday. I am using Kubuntu 16.04 with KDE backports enabled. I experience this either when I boot and don't log in promptly or when I enter the lockscreen. I would also like to note that the system was not 100% frozen, once every few minutes it seemed to response for a short time, enabling me to switch to the TTY. Then I always saw some processes hanging at 100% that I could not kill, or the kill was delayed for a long time. I always see the errors in the initial posts during that time. The TTY seemes to work fine though, once entered though. I've ran into this problem several times. After disabling C-states in the motherboard, my system has been running stable for ~5 weeks uptime so far. Ok, this trick did not help and my PC did not make it through the night without freezing again. However I finally found the real problem. I installed oibaf a while back as my Kubuntu was flickering all over the place. Now it seems the be the source of my problem. I deinstalled oibaf again and now everything seems fine. No lock screen freezing for me anymore. Im getting the same issues, brand new build. However there is another option under advanced - for GLOBAL C-States that i just disabled today and i am waiting to see what will happen. On BIOS v3.00 PC would freeze after 6 hours of idling or not touching anything. Come back to see my keyboard and mouse and everything was frozen. With BIOS v.3.10 now i get random reboots atleast once a day. Anyone know to direct me where the SoC voltage would be in BIOS? is it the VDD SoC? Anyone know how to update my kernel to 4.10 if it tells me i have the latest? Does this issue also happen on latest mainline kernel? I'm getting the same issues on several identical builds, with an ASUS prime X370-PRO motherboard. It's very hard to analyze since it happens randomly every other week, and it leaves no logs. It seems that the freeze happens at idle after very high memory load (observation after logging CPU and RAM loads). Compiling the kernel as suggested in this thread didn't work (new freeze this morning). I too still have random computer shutdowns without logs. Uptime varies from a couple days to a week or so. It happens it seems after being relatively idle for a long period. I do have high memory usage because of the VMs I run. I've disabled C-states, cool and quiet, tested memory, and so forth. I also compiled a new kernel as mentioned by Stuart. I do not have segfaults with compilations. I am willing to run tests and provide info. Please let me know if anyone wants something. I can confirm the issue with a week 33 Ryzen 1700 on Asus Prime B350 Plus. I had segfaults with my previous 1700 (week 22 iirc). No more segfaults with the week 33 CPU but still random crashes on (long time) idle. > bug" line in dmesg. > segfault bug was very easy: 3-4 mesa compilations triggered it for sure. The segfault compilation issue is well known. I had the same with my first 1700. AMD will RMA. My replacement chip has been fine. As for the other idle lockup issues, a combination of custom rcu kernel and python script to disable C6 has had my machine up for months. As I have said previously, I'm not sure that my problem was the same that others have (I didn't have freezes on idle, but rather freezes when compiling), but what helped me is updating BIOS to latest version. ASUS has released a new BIOS with AGESA 0070 for X470 Pro, and I can't trigger the bug anymore. As for ASRock, they will probably release update in a week or so, all vendors usually release new AGESA within a moth, as far as I remember. Same here, I'm using opensuse Leap 15 and Ubuntu 18.10, both 4.12 and 4.18 kernel suffer the same issue. I'm using AMD Ryzen 5 1600 with Asrock Fatal1ty AB350 Gaming-ITX/ac board. I'll try updating the latest bios to see if things got fixed. I am still receiving lockups even with the latest BIOS, all the BIOS setting recommendations here, and with the idle=halt kernel parameter. Although I am now fairly certain that I have a faulty motherboard (x470) which seems to be getting worse, and sometimes doesn't even get to the BIOS at all (I should have suspected something was up when I first bought it and the PS/2 port didn't work). I'm going to try replacing it and hopefully that'll help. Hi guys. I have an Asus ROG Strix notebook with Ryzen 7 1700. My CPU was manufactured on week 46 of 2017 (UA 1746PGS), so it does not have the segfault problem. My notebook completely freeze when it is idle, not always, but it is more common when newly powered (cool) or after heavy activities. The freezes never occurred during more intense use, only when idle. Like all notebook BIOS, my BIOS options is quite limited and does not have a "Typical current idle" or similar option. I tried to recompile the kernel with the option "RCU_NOCB_CPU" and also tried all possible combinations with the parameters "rcu_nocbs", "iommu=soft/pt", "idle=nomwait/halt", "pti=off" / "nopti", etc, etc, etc. The only alternative that actually solved the freeze problem was to use the program "zenstates.py" disabling the "c6state" core and package. But this attitude makes my CPU run about 5°C warmer. I used Windows on this same machine for weeks without any crashes. This makes me conclude the following: does not crash on windows (ok, it's a software problem, "linux"); CPU intel does not hang in linux (oh no, ok, it's a hardware problem, "Ryzen"). I do not know what AMD thinks about this, but I was forced to change my notebook. Now I got one with an Intel processor. Thank you AMD. > kernel suffer the same issue. > I'm using AMD Ryzen 5 1600 with Asrock Fatal1ty AB350 Gaming-ITX/ac board. > I'll try updating the latest bios to see if things got fixed. I updated the bios to P5.30, it only locked up for once so far. How do I turn the log on for this? I assume there is several (at least two) similar problems that cause spontaneous system hangs. One of them is mwait bug listed in AMD errata. Looks like idle=halt is partial workaround for this. But, as said in AMD community forum, guest OS in virtual machine may execute mait instruction and provoke this bug. Luckily, mwait is not common for user-space applications (still not sure about that). Another is power supply problem. This may be caused by unsupported PSU (no 0A 12V) or unsuitable power subsystem on motherboard. This may be partially (again!) solved by BIOS "typical current idle" option or disabling C6 states by .py script. IMO this bios option may be implemented not properly in some mobos firmware. Looks like it only "says to OS" do not use C-states, but does not prevent deep sleep on hw level. Here we got [Firmware Bug]: ACPI MWAIT C-state 0x0 not supported by HW (0x0) in dmesg and problem persists. Have read some forums with assures of completely stable Ryzen systems work under Linux without any tweks. So not really too many systems affected by mwait and PSU lockups. I think some combination of factors may provoke this behavior. Mobo+PSU, memory latency (why not?) or some vendor-provided bios config. Also in some cases these two problems may appear together. Obviously, segfaults or amdgpu crashes is not related to this bug. The PSU problem sounds like a weak excuse from AMD or may they are talking about very very bad 10 dollars units. That happens because the firmware already informed the kernel mwait/monitor cannot be used for c-states. If idle=halt is used, there is no c-state management and the idl instruction is used to put a core in idle mode. I think it is the hyper treading handling that is somehow bugged, somewhere. Also note that many ryzen users overclock their machine and if you overclock, you have to c-state problems at all. it means probe of this C-state failed and it must be avoided by kernel. Is there any difference between C-state list in OS with and without this option? I have only laptop with very limited BIOS and can't check. And there only C0-1-2. What about C6? What says zenstates.py about that? Frankly, I have not tried this script - do not want disable power-saving features for laptop. Also some overclocking may solve this problem (see comment 103). Turn on "performance bias" or similar option in BIOS for testing. This is pretty strange, could someone explain it to me? Wasn't mwait bugged in ryzen? I have revisited the errata. Errata 1033 "A Lock Operation May Cause the System to Hang" and 1109 "MWAIT Instruction May Hang a Thread" are the top contenders. According to page 12 and 13 of that document, Pinnacle Ridge processors are not affected. However, page 16 and 17 suggest 2nd Gen Ryzen are affected. This makes me conclude: either there is an error in the document, or Raven Ridge aka improved Zen 1 (Desktop and Mobile) are affected, while Pinnacle Ridge is not. During my latest tests on kernel 5.0.1, on AGESA 1006 and after upgrading to AGESA 0070, I wasn't able to reproduce any freezes / hangs on a Ryzen 7 2700, ASUS A320M-K (BIOS defaults, no OC, no Typical Current Idle setting), 16GB Patriot Viper RGB 3200CL16, ASUS RX480 8GB and Corsair AX860 (Haswell C6/C7 support, 80 PLUS Platinum). I installed a fresh, bare minimum, default Arch Linux install w/o any special configuration, let the system sit in idle for half a day and check log for hangs. Then, I enabled all power management features using powertop and let the system sit over night, still no hangs. I repeated the same for AGESA 0070, still no hangs. I think it's too early to conclude anything, as the hangs / freezes used to be very random. I will repeat my tests (on AGESA 0070) with a slightly more bloated system by installing GNOME. I am running Fedora on AMD Ryzen 5 2500U with Radeon Vega Mobile Gfx with Gnome. I use kernel parameters idle=nomwait iommu=pt processor.max_cstate=1 set via grubby. I am not getting any hangs unless I suspend with lid close or suspend on power button. It would probably be better to not execute an MWAIT per the errata. The method in comment 561 would work for those who have the gumption to build their own kernel. The iommu=pt I read about somewhere as useful to do, but I don't know if it helps. Some suggest set idle=halt which also avoids the MWAIT instruction. Looks like this patch makes kernel to ignore BIOS messages about unsupported C-state. this function used in "acpi_processor_ffh_cstate_probe" which further used in "processor_idle.c" file. It cause "cx.entry_method" value change from ACPI_CSTATE_SYSTEMIO to ACPI_CSTATE_FFH. It is really strange that this patch works but idle=halt is not. Maybe this is somehow silently disables C6 state. Can your system reach turbo frequencies with this patch? > Can your system reach turbo frequencies with this patch? Yes, I have a ryzen 1600 and I can see 1/2 cores running at ~3.6 GHz under some peculiar stress case. Why do you think the patch I pointed to won't give you C6? @Borislav has the fix for erratum 1033 "A Lock Operation May Cause the System to Hang" been applied so far? The suggested workaround was "Program MSRC001_1020 to 1b", but I couldn't find anything about it in master branch. According to the document, 1033 only affects B1. > branch. According to the document, 1033 only affects B1. and looking at bit 4 in the result. > and looking at bit 4 in the result. rdmsr yields 6800000000010, which has bit 4 set. > rdmsr yields 6800000000010, which has bit 4 set. Looks like your BIOS applies the fix. Now, does the patch in comment #526 fix your freezes? > > rdmsr yields 6800000000010, which has bit 4 set. I'm sorry, I don't currently suffer from any significant hangs on my machines when running stock Ubuntu 18.04.02 LTS (4.15.0-43-generic). I mostly meant #570 to demonstrate that some firmware does indeed implement the errata. While I've had core hangs and hard freezes in the past, the machine has enough workarounds applied to make it sufficiently stable. Current uptime is something like 81 days since the last incident and I can honestly not remember what it did then, but it's been used heavily as a build machine. From my memory: sufficiently RMA:d CPUs, slight overclocking, change the current idle setting in firmware, boot idle=nomwait. Back when I had significant problems, the best way to mitigate them was to disable SMT. It's possible that my increased stability has come from firmware implementing this errata, or it might be coincidental, I don't have enough data to tell. > > branch. According to the document, 1033 only affects B1. and if so, not affected. > and if so, not affected. A year ago I was affected by something (comment #295), but the issue appears to have vanished within the last months (comment #547 and comment #573). Also, they've made machdep.idle=hlt and machdep.idle_mwait=0 default for Ryzen processors. I've additionally checked the registers mentioned in FresBSD's source. Latest BIOS 4406 (w/ AGESA 0070) for my ASUS A320M-K seems to apply fixes for all affected errata. Eventhough I can't reliably reproduce the stability issues anymore, I think it's still good practice to have Boris' patch applied, since it's addresses a known erratum. I'll test the patch and check for regressions. I'm actually desperate about this issue. I'm looking forward to see results of Boris' patch, though I really doubt it will solve this issue. Needs explicit check against self-built kernel really. Has your patch been applied to kernel yet? > Has your patch been applied to kernel yet? No it hasn't - I'm still waiting for someone to test it and confirm that it fixes the issue on their boxes. And by issue I don't mean erratum 1033 - that is a red herring anyway - but the lockups people are reporting on some broken BIOSes. Yes, your patch "seems" to work in my case. I've spent the last few days reading through this thread. I have Fedora 28, ryzen 1700x, and ASRock Steel Legend B450M. It's a server mostly used for files at the moment. Bone stock Fedora 28, samba, ZFS. With GPU plugged in, hangs within 6-10 hours. Replicating this too often since March 27th. With GPU unplugged, hangs happen within 10-20 minutes. Replicated 3 times. Does not hang while SSH'd in. Ran Memtest and tested for the segfault issue. Hardware is fine. Bought 'open box' on Amazon; this was in case they were re-selling an affected CPU without knowing. Have not tried alfie's patch. Do have kernel 4.20 compiled with alfie's newest rifw patch as per Comment 580. - Haven't tested anything else because I needed to have reliable access to my shares for my days off. This was 1 seemingly sure-fire way of making that happen. Will update with more results once linux 4.20 with borislav and Alfie's patches tested. Could be a couple days. Less if 'Typical Current Idle' doesn't work, as I'll likely be RMAing my mobo and CPU. I used the rifw=alfie with a 1700x on an MSI X370 Gaming Plus BIOS 7A33v5H with no freezing for 1 week. Computer was rock solid on older BIOS (7A33v55) for a year+ until BIOS update to latest. I'm using low power idle option with kernel 4.14.111 opensuse 15.0. 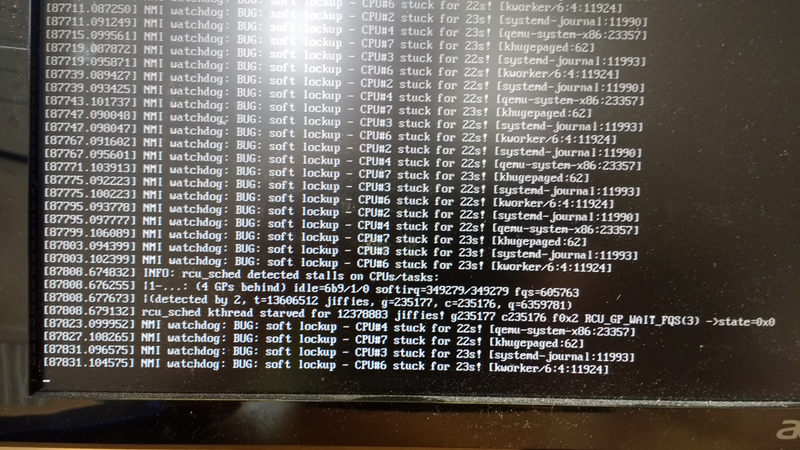 PC had kernel: [Firmware Bug]: ACPI MWAIT C-state 0x0 not supported by HW (0x0) - After BIOS update and gone now after patch in Comment 580 with rifw=alfie boot option. I haven't had the chance to get through the whole thread yet and not sure if I'll have enough time today. However, I wanted to quickly ask if anyone has faced this issue with an Intel processor? For some additional information, this setup does leverage Nested VMX to run Docker containers with the --privileged option enabled. The soft lockups seems to occur at a rate of varying from 1-5% of our VMs getting impacted in a 24-hour period running in this configuration. The load on the cluster does not seem to impact the frequency of the issue. One thing I did notice is that it seems most/all of the kernel panics have had been involved with a call to smp_call_function_single. Since I have not made it far enough through this thread, I'm not sure if the focus on this is exclusively on AMD, or if anyone else had an Intel example? Is there a fix in the pipe for this issue and if so, a target kernel version? I've went through this thread, and tried to disable c6 state, add idle=halt with no effect. Followed this excellent reprod steps in https://www.reddit.com/r/Amd/comments/apw8im/ryzen_freezes_in_linux_even_if_linux_is_in_vm/ It is pretty consistent. However, switching to gcc-8 seems resolved this for this particular reprod steps. With dmesg -w, I was able to capture and verify this is indeed a soft lockup. Attached the dmesg output. It is a Threadripper 2920x with MSI x399 Gaming Pro Carbon AC with latest BIOS on Ubuntu 18.04.2 LTS. If I hit the problem those days (gcc segfault), I had to rapidly reboot my machine because it mostly hang completely some time later. This thread here covers the problem of hanging Ryzen CPU's when the machine is completely on idle over some time (it's the opposite of the problem you're facing and I saw before CPU RMA). I "fixed" the hang on idle problem by slightly overclocking the CPU (+200 MHz - ASUS X370-PRO / BIOS 4011 04/19/2018 - Bios option: Optimization for daily computing). All other suggested workarounds don't work for me. But you can't say, overclocking would fix the problem for sure (as any other suggested workaround). But you could try it. My understanding of that issue is it only affects Ryzen 1700 / 1700x and doesn't affect Epyc / TR line. I am on ThreadRipper 2920x, which should be out of marginality problem for over a year now. Also, it doesn't SegFault at any point, just hangs. I do believe it is the similar problem as this thread, but since it is rare, so it could be just one faulty CPU for sure. Just doesn't align well with marginality problem timeline. I have a couple of Threadrippers (1950X) that also hang under very specific workloads with a Asus X-399-A motherboard. In my case when the freeze happens the only way to get the machine back is to unplug it from the wall and plug it back. Not even reset works. After many tweaks, I found out that I can avoid that but setting either the "overclocking enhancement" on in the BIOS (this is specific to Asus boards) our manually setting the Vcore to something like 1.315V (which should work on all motherboards). My guess is than when in idle the motherboard drops the voltage too low and the CPU hangs. I ran into similar problems to this with a Threadripper 1950X and none of the proposed workarounds did anything. Disabling C6 in the BIOS made it fail to boot for some reason. Setting "Typical Current Idle" in the BIOS, processor.max_cstate=1 in the kernel command line, or disabling C6 with ZenStates.py all had no effect. I also tried overclocking and underclocking. I eventually did a from-scratch reinstall of Fedora 29 and it suddenly just works (for 10+ hours, I don't leave my machine on overnight). Once it started working, I set everything back to the defaults except for "Typical Current Idle" (since I have a PSU from 2010 and I doubt it supports any fancy features from 2013). I strongly suspect that the graphics driver was the problem since my lockups would cause the screen to become completely unresponsive, but sound continued working, and in one case I had a lockup during a video call and the other person could still see and hear me. I plan to try the proprietary drivers again sometime and I'll make a note if that brings the problem back for me. > the other person could still see and hear me. 2019-01-22 netfilter: nf_conncount: restart search when nodes have been erased Florian Westphal ? > fancy features from 2013). a) Fedora 29 has very new kernels. In the last few weeks they rebased to 5.0 and 5.0 is supposed to have a lot of Ryzen fixes in it. b) For me "Typical Current Idle" (plus mwait) was all that was required to fix the problem. I'm pretty sure kernel 5.0 makes it so mwait override is not needed. We never used proprietary video driver and we both had the problem and fixed the problem. Same with EFI: we use just legacy mode. FS should not matter at all. Displaying first 40 and last 40 comments. View all 678 comments or add a comment.